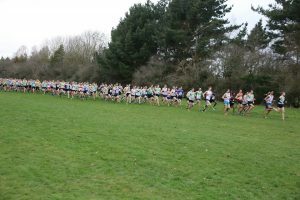 The Area Cross Country Championships took place at the weekend, with many of the country’s top runners competing in the North, South and Midlands XC races. For Team Teal, it was a great opportunity to test their fitness ahead of the final league races of the season in two weeks’ time. 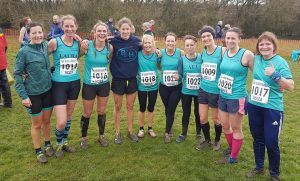 The Midlands race took place at the challenging Newbold Comyn, Leamington, with its infamous ditch a lot drier and relatively mild conditions for the time of year, still the course was no less tough than usual. Both BvH Senior Men’s and Women’s teams turned out in force, with Tom Bunn also competing in the Men’s Under-20s 8km race. Everyone enjoyed the opportunity to support and be supported. There are some great photos thanks to Nic Sykes, Emma Hawkey and Pete Hickman, on the Facebook group showing grit and determination from all who took part. 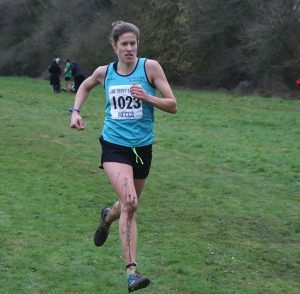 There was another very impressive performance from Nic Sykes, who was on the podium again, second only to favourite Kate Holt of City of Stoke, who retained her title over the 8km course. In the Men’s 12km race Henry Brocklehurst was first home for BvH in 35th position. In the team competition the honours went to Notts AC (Men) and Bristol & West (Women). The other scorers for BvH’s teams were Paul Thompson, Mat Pollard, Richard Keep, Iain Jones and Jon Stanforth who finished in a very respectable 7th out of 33 complete teams. Completing the Women’s team were Lorna Al-Ani, Monica Baptista, and Alison Price who came 8th of 35 teams. Congratulations to everyone who took part and thanks to all the supporters on the day. This entry was posted in Announcements, x-country by BvH Admin. Bookmark the permalink.